Rogue Fitness has purchased twenty-plus years worth of engineering by Tom Eilerman that spans the entire professional fitness industry. Nebula has had a great reputation for designing and building the highest quality, heavy-duty, low maintenance equipment. This reputation aptly resembles the Rogue Fitness philosophy of providing high grade equipment that will stand up to any abuse you can throw at it. As we fold the Nebula brand into Rogue Fitness, any equipment designs we manufacture will resemble Rogue caliber craftsmanship. This catalog addition is a big step for our team and we are excited to expand our American-Made lineup. As a result, this will mean more jobs for Columbus, Ohio and there's nothing more exciting for us than that! Rogue Fitness will be incorporating and rolling out Nebula Fitness design variants as it folds Nebula Fitness into its operations. 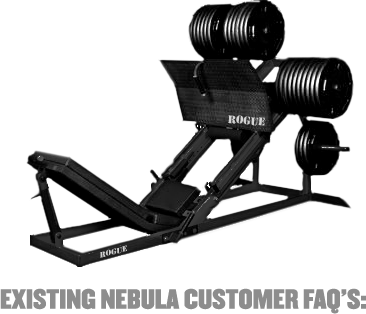 Please check www.roguefitness.com often for updates, and subscribe to Rogue's email newsletter. Rogue Fitness will be rolling out various items and variants as it folds Nebula Fitness into its operations, but can not guarantee if or when specific items will be available. Please check www.roguefitness.com often for updates, and subscribe to Rogue's email newsletter. © 2010-12 Rogue Fitness. All Rights Reserved.